Too Many Schools Are Failing Young People with Developmental Disabilities. Here’s How to Fix it. Imagine getting injured in a car accident and checking in to a rehabilitation center for treatment. But instead of preparing you to go back to your job and community, staff at the rehab center treat you like you’re never going to leave. They put you to work doing menial tasks for less than the minimum wage, and don’t tell you that there are options and services that would allow you to work in the community. Nineteen years ago this month, the U.S. Supreme Court prohibited this kind of unjustified segregation as a violation of the Americans with Disabilities Act (ADA). Recognizing that the unjustified isolation of people with disabilities is a form of discrimination, the court’s landmark ruling in Olmstead v. L.C.requires states to eliminate unnecessary segregation and ensure persons with disabilities receive services in the most integrated setting appropriate to their needs. But nearly two decades after Olmstead, hundreds of thousands of people with developmental and intellectual disabilities, mental illness, and physical disabilities are still employed at subminimum wages in publicly-funded factories known as sheltered workshops. One of the reasons for this is that many public education systems are failing to give students with disabilities, including those with intellectual and developmental disabilities, a real opportunity to learn about and prepare for integrated employment. Young people with disabilities are often placed in segregated sheltered workshops while they’re still in school. Without the opportunity to participate in mentorships, paid work experiences, or internships, they are shunted into “pre-vocational training” programs that have them performing manual repetitive tasks in segregated settings. Mastering a menial task is not the same as learning a marketable skill. In fact, some of these so-called “work readiness” programs become pipelines for sheltered workshops, consigning young people to a lifetime of segregated employment – without ever giving them a real alternative. 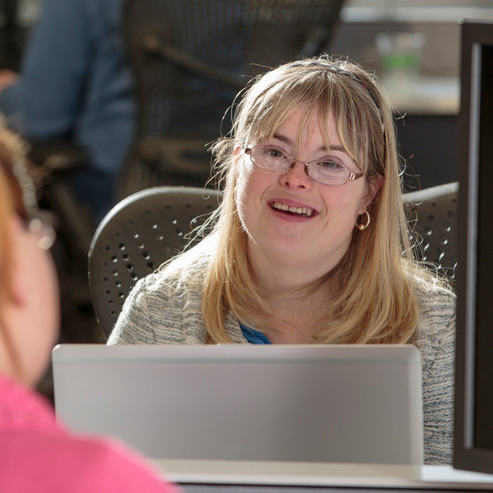 There is now more than thirty years of research, legal precedent, and federal statutes and regulations – and an abundance of services available to help bridge the gap and help people with disabilities succeed in typical jobs at competitive pay. The evidence is overwhelming that even people with the most severe disabilities can thrive in typical workplaces, where they are shown to boost productivity, enhance creativity, and help the bottom line. In 2014, the federal Workforce Innovation and Opportunity Act took another important step toward realizing the goal of competitive employment – placing new limitations on the use of subminimum wage employment for youth with disabilities. But the reality still hasn’t caught up. Many people don’t realize that Olmsteadand the ADA, along with the Individuals with Disabilities Education Act (“IDEA”) and WIOA, are highly complementary and must be implemented in combination with one another. As we explain in our policy brief for the Institute for Educational Leadership, this framework can help students avoid sheltered workshops altogether and transition into integrated jobs that pay at or above minimum wage. Here are four steps state and local governments should take – right now – to ensure that students have a meaningful opportunity to make an informed choice to work in integrated employment settings after leaving school. Provide information about the benefits of working in competitive integrated employment. Provide benefits counseling and plans to explain the impact of competitive work on an individual’s public benefits. Importantly, under WIOA, young people with disabilities are required to receive many of these vital services before they are allowed to work in subminimum wage employment. Now is the time for state and local governments to advance these practices and boost students with disabilities into the mainstream of the economy.